The tortoise is the third member of the Chelonian family – along with turtles and terrapins. Chelonians are also reptiles, which means they are cold-blooded and warm themselves by drawing heat from their environment. They have four legs and a shell that is joined down the sides. They also have strong, horny mouths, or beaks, and no teeth. The largest tortoises are the giant Galapagos, which lives in the Galapagos Islands in the Pacific Ocean off the coast of South America, and the Aldabran, which lives in the Aldabra Islands off the coast of east Africa. 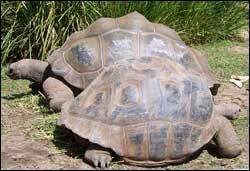 The Galapagos Tortoise can grow to about 1.5 metres (4.9 feet). The Aldabran can weigh up to 300 kgs (660 lbs). Most species of tortoise live on land, but some live in fresh water. They live in many different types of environments from deserts and semi-arid areas to lakes, lagoons and swamps and tropical forests. Tortoises are also kept as pets in many countries. In Australia the Macquarie, Murray River short-neck and Common long-neck are popular. In the wild, most tortoises browse for food – moving around a large area, eating small amounts of food as they go. Some tortoises are herbivores, and eat only plants. Others are omnivores, meaning they will eat anything available including plants, fruit, live prey and carrion. Tortoises need calcium to build their bones in the same way that humans do. Those that live in warmer climates bask in the sun. The rays produce vitamins in the tortoise’s body, which work with the plants they eat to produce calcium. Colder climate tortoises get less sunshine, so they eat more protein and foods that contain calcium. Chelonian bodies are suited for different environments. Tortoise legs are short and stumpy, and their feet have claws for digging and moving around on the ground. Sea turtles have longer legs with flippers, and fresh water turtles or terrapins have claws and webbed toes, for digging and swimming. The tortoise carapace, or top part of its shell, is dome shaped and higher than a turtle or terrapin carapace, which is flatter and better for swimming. Tortoise carapaces come in many different colours and patterns. The Star tortoise has a dark brown or black background and light brown or yellow lines fanning outwards in a star-like shape. The Leopard tortoise is very distinctive. It has cream to yellow skin and its carapace has black blotches, dashes or stripes on a cream to yellow background. Female tortoises dig burrows to lay their eggs in. After 3-4 months, the hatchlings break the eggshells open with their beaks and dig their way up to the surface. Once on the ground they move into their mother’s burrow and she protects them for another two months or so. This is different to turtle hatchlings who head for the water and fend for themselves as soon as they break out of their eggs.